We cut one open in disbelief – yep. Disgusting. Really wish we hadn’t seen that. Instant toss. But what now? Measuring cups and containers are good fun, but they just don’t have the personality of those little squirts. There are a few rubber duckies on the market that are one-piece, without squirt holes. But a quick search yielded a terrific find – a rubber ducky who’s not only hygienic, but also PVC-, Phthalate- and BPA-free! Ducki from Dano2 solves the hygiene problem with a pop-out bottom – it can be thoroughly cleaned and dried, inside and out. Ducki retails for just $8, and is available in four bathtastic colors: citrus, raspberry, caribbean and mint. His sassy upturned beak and tail make for great teething, too. Turns out a heart is a natural shape for teething, offering some round bits and pointy bits to satisfy a range of nibbling needs. This fabulous teething toy is made of sanded unfinished maple, and looks delicious! 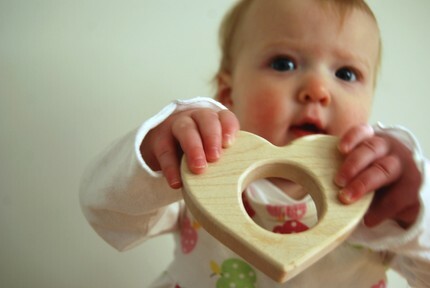 Get your Little Heart Teething Toy at Etsy for $12, a portion of which goes to plant trees through Trees for the Future.